Life is a journey that has it’s own up’s and down’s, no ones journey is the same but when comes to breakup the final outcome is always deep brief and broken heart. If you’ve just had a break-up with your partner and decided to end that years long relationship, you are bound to have brief fill your heart with the good and bad memories with your partner. You confine yourself into the corner of your bed and call the life an end, without even trying to judge its consequences. 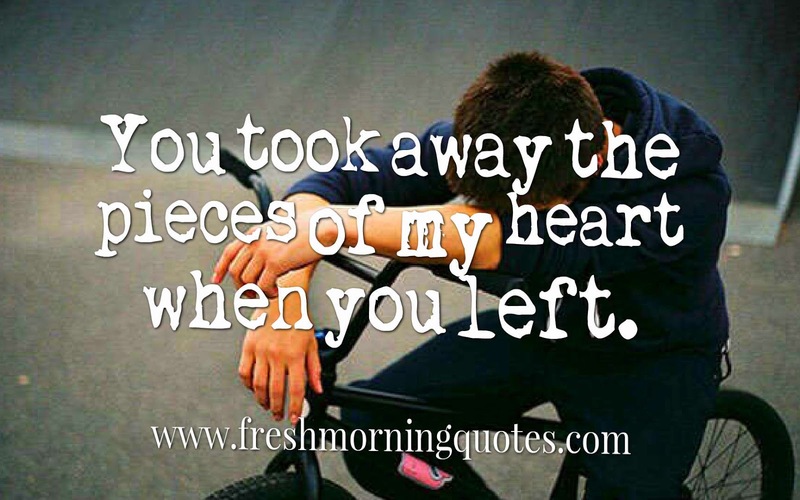 It hurts so much when you are betrayed by someone you love and this can sometimes lead to depression or even stress. However, you can get over this traumatic situation by comforting yourself with Sad love quotes that will let your emotions flow out through tears. To completely sympathize with your agony and depression, here are some sad quotes about love. These sad love quotes might not make you happy but at least give you the strength needed to get over someone and make a fresh start. When you feel sorrowful after ending a relationship, share these heart touching sad love quotes in social networks, because a single sad quote will express your feelings and let your beloved ones know what you are going through and let them come forward to support you for the good. A million words would not bring you back; I know because I tried. Neither would a million tears, I know because I cried. sometimes it’s hard to keep on going, especially if it’s without you. Don’t make someone your everything. If they leave, you’ll have nothing. We always thought we’d look back on our tears and laugh, but we never thought we’d look back on our laughter and cry. When I see you smile and know that it’s not for me, that’s when I miss you the most. 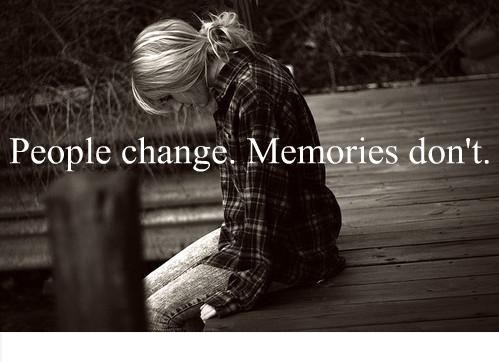 Nothing fixes someone so intently in the memory as the wish to forget them. You hurt me more than I deserve, how could you be so cruel? I love you more than you deserve, why am I such a fool? Even if I already knew you were gonna break my heart, I still wouldn’t change the fact that I fell in love with you. Sometimes life doesn’t give you what you want, not because you don’t deserve it, but because you deserve more. Never rekindle an old love no matter how strong it was, because it’s like reading the same book, over and over again.. already knowing its end. 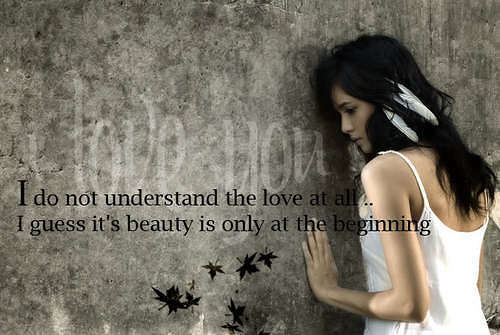 “Love doesn’t cost a thing” except a lot of tears, a broken heart, and wasted years. I hate you and everything we once were. Letting go doesn’t mean you don’t care about someone anymore. It’s just realizing that the only person you have control over is yourself. If you love me, let me know. If you don’t, please let me go. 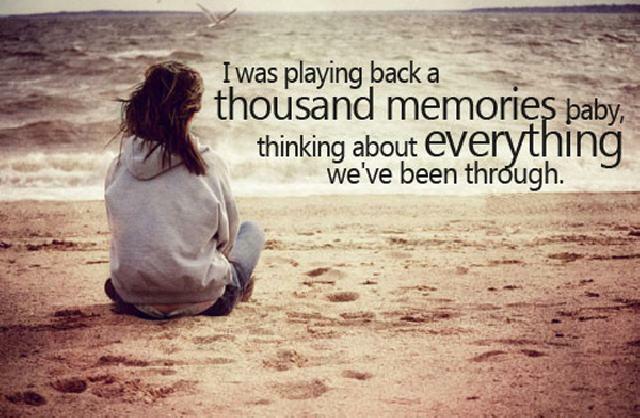 It’s crazy how you can go months or years without talking to someone, but they still cross your mind every day. I don’t chase after anyone anymore. If you want to walk out of my life, there’s the door. I’ll even hold it open for you. When people can walk away from you, let them walk. Your destiny is never tied to anyone who left. Once you put all the pieces back together, even though you may look intact, you’ll never be quite the same as before the fall. The hardest thing to do is watch the person you love, love someone else. I’m afraid to love, afraid to love so fast, because every time I fall in love, it seems to never last. Maybe someday I’ll be what you want, but don’t wait too long because the day you want me may be the day I’ve finally given up. There comes a point when it’s not that you don’t care anymore, you just can’t. My plan is to forgive and forget. Forgive myself for being stupid and forget you ever existed. I gave you everything, but it wasn’t enough to make you stay. I gave you my heart and you broke it. Now you love me but I don’t love you. Everybody wants happiness; nobody wants pain. But you can’t have a rainbow without a little rain. How many times can your heart break until there’s nothing left to be broken? Time doesn’t heal anything… it just teaches us how to live with the pain. Sometimes you have to accept that people’s part in your story is over. I can’t believe you keep doing over and over the only thing that hurts me. You can never “just be friends” with somebody you used to love, simply because a little part of you will ALWAYS love them. Just because you know someone would wait for you forever doesn’t mean you should let them wait that long. It’s sad when you realize you rejected other people for that one person that wasted your time. I miss you more than you’ll ever know. It hurts when your heart is being broken while his heart is being fixed by someone else. I hate being second to those I put first. The sad thing is that I actually thought you’d be different. I hate the way that, even though I’ve moved on, you still sneak into my mind. She seemed so strong, standing there smiling. Little does anyone know, last night; she fell asleep crying. Back in school, they didn’t teach us what we needed to know, like how to deal with despair or a broken heart. The worst part of being lied to is knowing that you weren’t worth the truth. I never let you go because in the back of my mind I still believe that someday we’ll get our second chance. Stay silent and let them see what their life is like without you in it. I hate this feeling. It’s one I know all too well. It’s a thing called heartbreak and it hurts like hell. If you cheat on someone who’s willing to do anything for you, you’re actually cheating yourself out of true loyalty. Sometimes you have to get knocked down lower than you have ever been to stand up taller than you ever were. 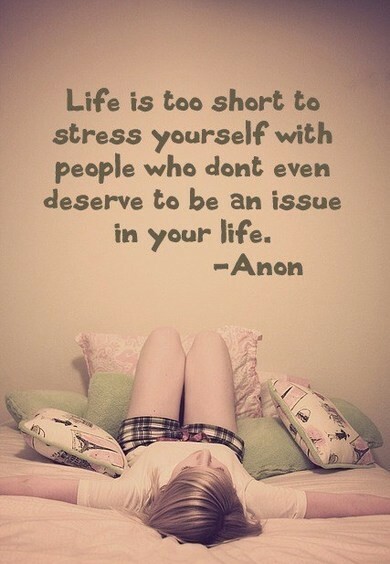 The biggest mistake I’ve ever made was letting people stay in my life longer than they deserved. People don’t notice the things we do for them until we stop doing them. I can pretend I’m not dying inside, but just so you know… I am. I hate the stars because I look at the same ones you do without you. A million words won’t bring you back, I know because I tried. Neither will a million tears, I know because I cried. True love will never fade, unless it was a lie. 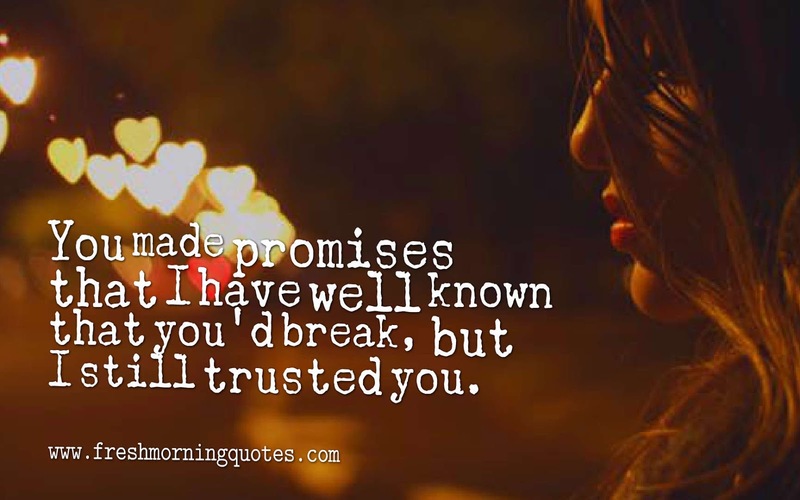 I trusted you, but now your words mean nothing to me because your actions spoke the truth. 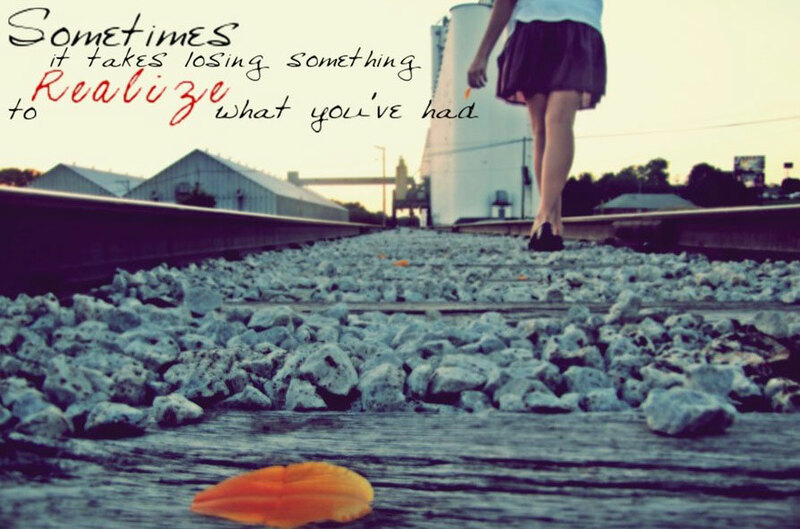 Sometimes you don’t know how much something means to you until it’s taken away. I forgive, but never forget because I never want to be hurt the same way twice. 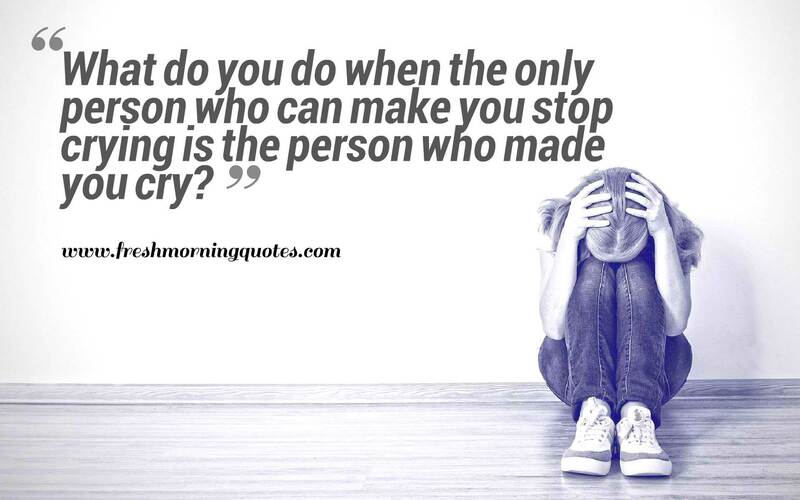 Who do you turn to when the only one you can trust is the one who made you cry? It’s hard to forget someone whom you’ve imagined spending forever with. Just because I finally got over you, doesn’t mean there aren’t days when it all comes rushing back. Sometimes you have to let people go because they’re toxic to you. Let them go because they take and take and leave you empty. I hope you find someone you can’t live without. And I hope you never have to know what it’s like to have to try and live without them. 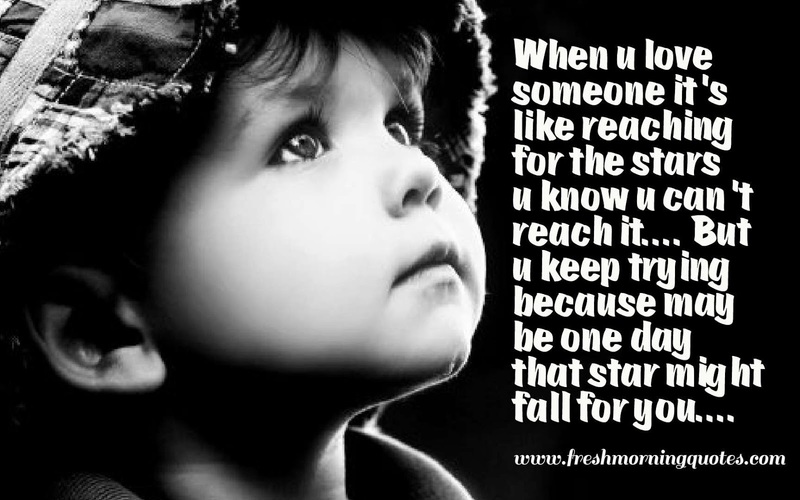 Don’t waste your time giving someone a second chance when there is someone better out there waiting for their first. Truth is, you’re the reason I don’t believe in love anymore. If someone wants to be a part of your life, they’ll make an effort to be in it. I’m not ignoring you. I’m waiting to see if you’ll make an effort for me. Love is as delicate as glass; once broken it can be fixed, but there will always be cracks. Love leaves a memory that no one can steal, but sometimes it leaves a heartache that no one can heal. I would give up everything for one moment with you; for one moment is better than a lifetime of not knowing you. Why did I fall for you when you keep falling for her? You not wanting me was the beginning of me wanting myself. Someday, someone’s gonna thank you for letting me go. While I was holding on, all you did was let go. And that day finally came; when his name didn’t put a smile on her face. Sometimes the best way to be happy is to learn how to let go things you tried hard to hold on to that are no longer good for you. Sometimes what you’re most afraid of doing is the one thing that will set you free. People think it’s holding on that makes you strong, but sometimes it is letting go. Sometimes it’s easier to pretend that you don’t care than to admit that it’s killing you. Be careful when you’re trying to fix a broken person because you may cut yourself on their shattered pieces. Every time I see him all cool, calm and collected, I lose my breath, my heart starts pounding, and I’m painfully aware that I’m not over him, but that he is over me. Every heart has a pain. Only the way of expressing it is different. Fools hide it in their eyes, while the brilliant hide it in their smile. The person you love and the person who loves you are never the same person. Having a broken heart is like having a broken rib. Nobody can see it, but it hurts with every breath. I don’t think I ever really loved you. I think I was in love with the idea of you. Love that we cannot have is the love that lasts the longest, hurts the deepest, and feels the strongest. Relationships are like glass. Sometimes it’s better to leave them broken than to hurt yourself putting them back together. Am I ever gonna be good enough for you? I’m really scared of being happy; it never lasts. I wish I could turn off my feelings. A tongue has no bones, but it can break a heart easily. If you feel any remorse for what you did, you will not hurt yourself. Sometimes the person you’d take a bullet for ends up being the person behind the gun. If another woman steals your man, there’s no better revenge than to let her keep him. Real men can’t be stolen. The most painful part of leaving the person you love is that they’ll never come after you. What happens when he’s your prince charming, but you’re not his Cinderella? When you start to wonder if you can trust someone, that is when you know you already don’t. I don’t know if I’m getting over him or if I’m just getting used to the pain. 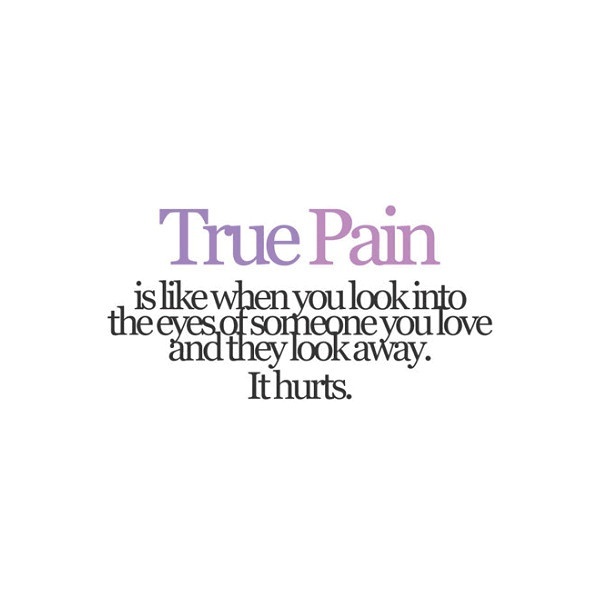 True pain is when you look into the eyes of someone you love and they look away. Our sweetest songs are those that tell the saddest thoughts. Don’t you dare remember me when she gets over you. I wish I saved all the tears I cried for you so I could drown you in them. Pleasures of love lasts but a moment, pain of love lasts a lifetime. It takes 3 seconds to say, “I love you” 3 hours to explain it and an LIFETIME to prove it. It’s really hard when your loved ones leave you, and you cannot accept the reality of life. that the special person made your life so beautiful is the worst thing ever happened to you now. to life some of that pain from your heart and mind. 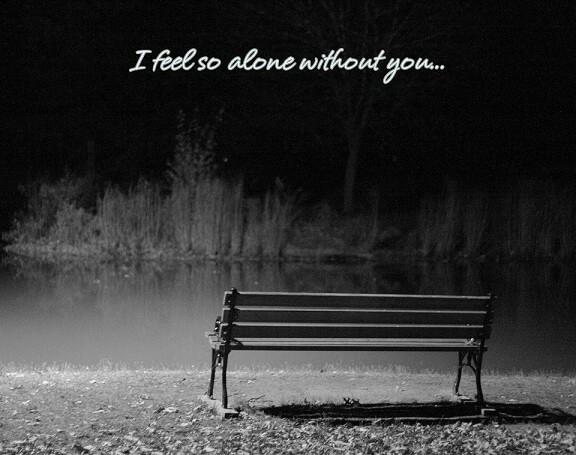 we have gathered some of the best sad love quotes that can bring tears in your eyes. It’s the time when people are lonely because of their dear ones going away, the painful moment in every ones life.